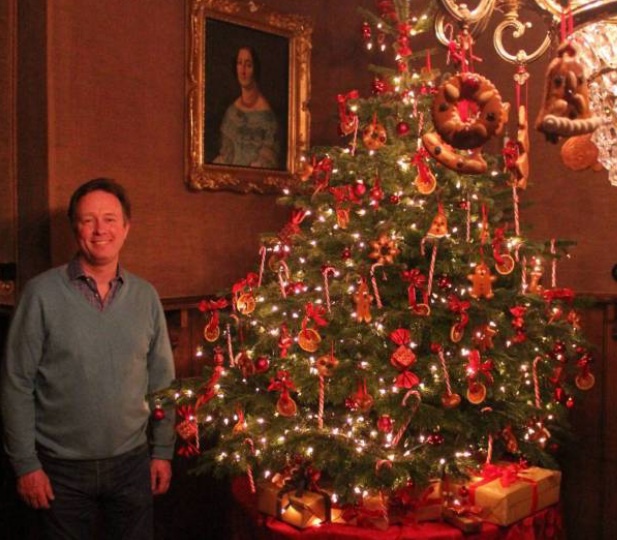 Christmas in the Castle with Prince Gustav of Sayn-Wittgenstein-Berleburg. On December 3, 2015, His Serene Highness Prince Gustav of Sayn-Wittgenstein-Berleburg spoke with his local newspaper about the exhibition, Weihnachten im Schloss (Christmas in the Castle), that he along with his longtime partner, Miss Carina Axelsson, developed together at Schloss Berleburg in Berleburg, Germany. Established in 2010 the exhibition — which displays nine beautifully decorated Christmas trees each with their own name such as the Candy Tree, Tinsel Tree and of course the popular Dog Tree — proved to be incredibly successful the public that the prince and his partner have decided to keep the tradition alive each year. Anyway, the Weihnachten im Schloss exhibition, which includes a personal tour of the historic schloss, will be open to the public beginning on December 23-31, 2015 at Schloss Berleburg. 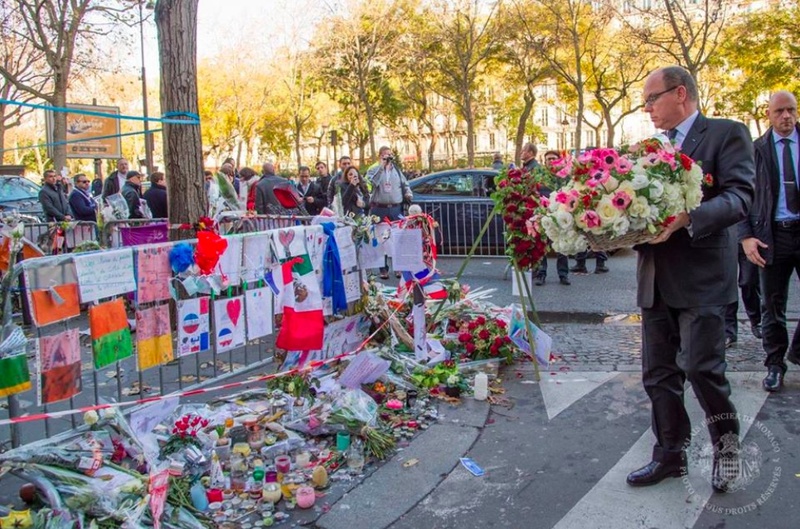 (VIDEOS) HSH Prince Albert II of Monaco Visits the Bataclan in Paris, France. 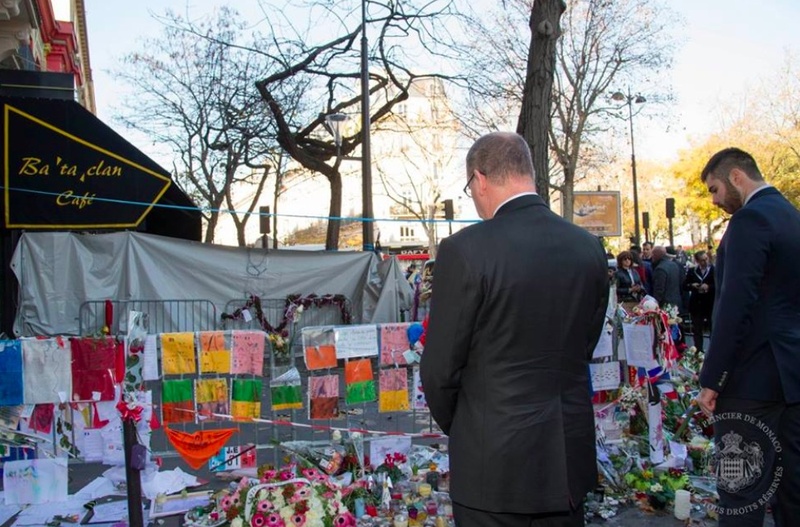 On Wednesday, December 9, 2015, His Serene Highness Prince Albert II of Monaco arrived at the Bataclan Concert Hall in Paris, France, to pay his respects to the victims of the November 13, 2015 terrorist attacks. 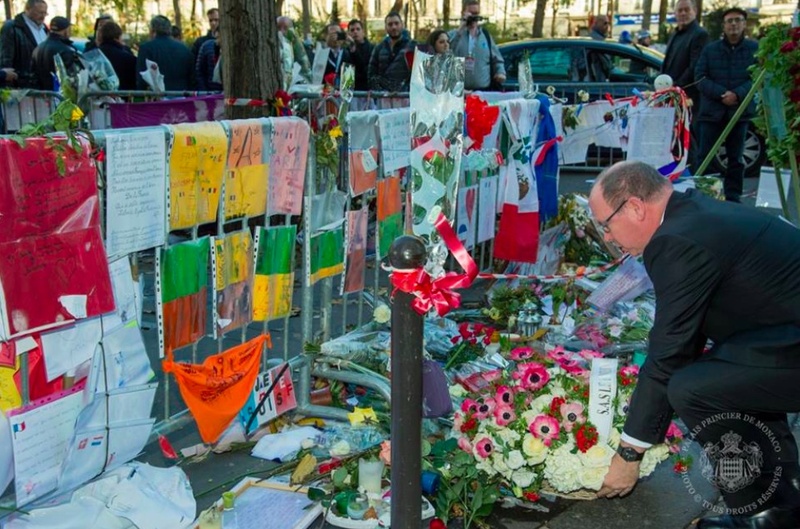 Whilst at the concert hall the sovereign prince placed flowers at the makeshift memorial site as well as had a moment of silent prayer in remembrance of the innocent victims. (VIDEOS) News Regarding Members of the Imperial Family of Japan. On Tuesday, December 8, 2015, Their Imperial Majesties Emperor Akihito and Empress Michiko of Japan visited the OX Engineering factory in Chiba, Japan. 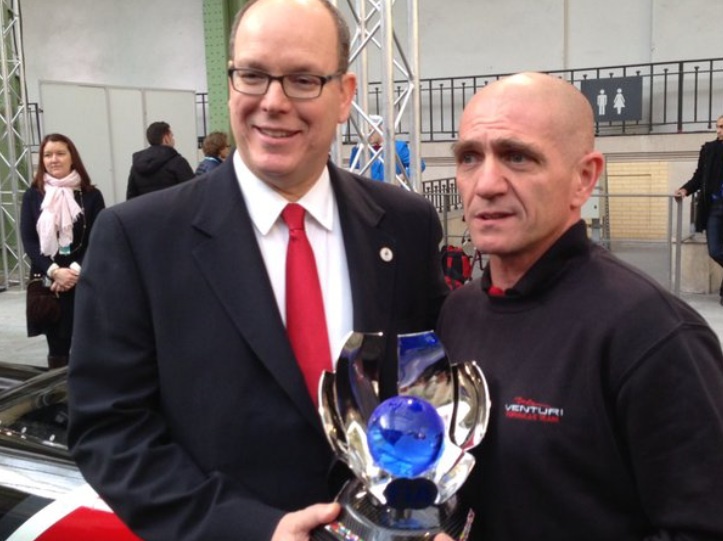 The company makes custom made wheelchairs for athletes. And, finally, Her Imperial Highness Crown Princess Masako of Japan celebrated her 52nd birthday on Wednesday. On the occasion of her special day the Imperial Household Agency released a new photo as well as a written statement from the lovely princess who takes a look back at the past year. “This year, it hit after the war 70 anniversary, it was important year that take a fancy to the preciousness of peace throughout the year. It also occurs in natural disasters around the world this year, even in Japan, my heart aches that precious human life is lost, such as Ibaraki Prefecture Joso. With such a disaster, with represents the deep condolences to those who have passed away Unfortunately, for the bereaved families and victims have been people, I would like the sympathy sincerely. On the other hand, in addition to the two Japanese following the last year has been awarded the Nobel Prize in their respective research fields, such as cited Japan representative for the first time three wins in the Rugby World Cup, there was also good news to put domestic Genki. With regard to myself, in July this year, by invitation from the Tonga royal family, visited the Kingdom of Tonga to join us and the Crown Prince, and I was able to be allowed to attend the coronation of His Majesty the King. During your stay, from everybody that was including the Tonga royal family, I have I am very grateful that it has received a warm welcome and your thoughtfulness. At the same time, people of Japanese nationals and Japanese Americans, penetration in Tonga society, we were delighted that it is active in the local. In October we visited the Fukushima Prefecture along with the Crown Prince, many people are woven that are forced to evacuate life away now tail hometown, also, among which is also harmful rumors, Shin I want to further shining Fukushima than before the disaster, I want to contribute to the region back to the future hometown, and is in contact with the words of the high school students full of positive feeling that, pleased, also I thought it was encouraging. In addition, an attempt to overcome hard the harmful rumors, I’ve also visited tomato farmers are doing their own various initiatives, the efforts, now, reliably that have borne fruit little by little, I thought it was pleased . Affected areas of reconstruction is still a middle road, while sincerely hope that every day that you live in peace to the people of the affected areas has come back early than a day, now also Crown Prince and to join us, and a long time in the reconstruction of the affected areas I would like to approach the heart. In addition, at the end of October National Cultural Festival and was held in Kagoshima Prefecture, is that it was able to attend while received a warm your good thoughts of the Emperor and Empress in the November garden party, was that happy Nitorimashite me. In particular this year to hit the year of turning point that post-war 70th anniversary, various events related to the previous war was held at home and abroad. The Emperor and Empress, but now visit the Republic of Palau in April, I was struck by your appearance, which is a memorial to the war dead with great your heart. This summer, the Crown Prince, along with Aiko, I myself was also received the opportunity to visit some of the events related to the previous war. There, along with the’ll show a variety of exhibitions, and the war and the subsequent harsh internment lifestraightOr FlipTo hear a story of experience have been people and their families in, I deeply once again think in misery and the preciousness of peace of war. Aiko also received the opportunity to actually see and hear the experiences of exhibitions and war of the facilities we visited together, also in addressing the summer homework in school, history and war, how is Japan from the post-war devastation about what has made the reconstruction, we learn with interest, we felt that gave me a better understanding. On this year is, and asked their thoughts to the many people who died in the previous war, sincerely wish peace and friendship with other countries, now also build a better Japan, to continue the effort to go take over to the next generation We thought that it might be became important milestone in. Their Majesties the Emperor and Empress is, two years ago, it did you healthy to welcome Sangju in succession last year, and, in this year of July, and welcomes the Emperor and Empress to the Crown Prince’s Palace, the Empress of Sangju of celebration and such am allowed held, we’re glad that we were able to join us the opportunity of two years ago to come of Their Majesties celebration. Then, to the Empress, the findings myocardial ischemia is suspected Ali becomes your, that it has been received your diagnosis requires careful observation, We look worried you sincerely. The Emperor and Empress, Come in busy of your public service every day, and Nasari to your care of your body earnestly, I pray that you will in the future also purchased healthily stay. In addition, the Emperor and Empress, while received your thoughtfulness than daily, in that it is our watch you warmly at me and Aiko, We would like to thank from the bottom of my heart is now overlaid. The other day, that Prince Mikasa like now to pick up your healthy 100-year-old birthday also Kangaibukaku was there that it is happy. I would like to sincerely pray sincerely the future lasting your health. Aiko is a state in which familiar to junior high school life, we enjoy school life with a lot of friends. It becomes second grade, a variety of activities in the study and school also appeared to have become more busy, also, but has increased the opportunity to go out to various places, while now also further expanding the width of the alternating current, a variety and stacking the experience, we hope to want go send a daily that was fulfilling. (VIDEOS) TRHs The Duke and Duchess of Cambridge Attend a Charity Event in London. On Wednesday, December 9, 2015, Their Royal Highnesses The Duke and Duchess of Cambridge participated in the 23rd annual ICAP Charity Day held at the offices of ICAP Brokers in London. 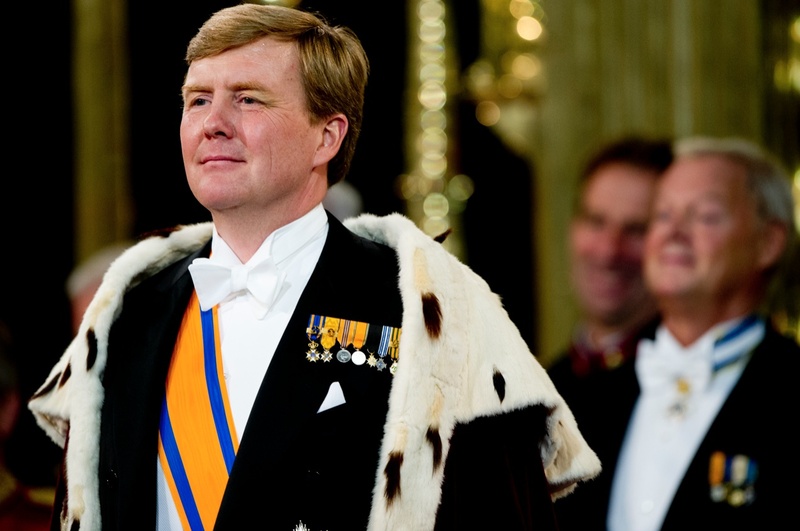 HM King Willem-Alexander of the Netherlands Receives Credentials. On Wednesday, His Majesty King Willem-Alexander of the Netherlands received credentials from the Ambassador from Finland, Ms. Katri Elina Viinikka, and the Ambassador from Montenegro, Mr. Vladimir Radulovic. The credentials ceremony took place at Paleis Noordeinde in Den Haag. 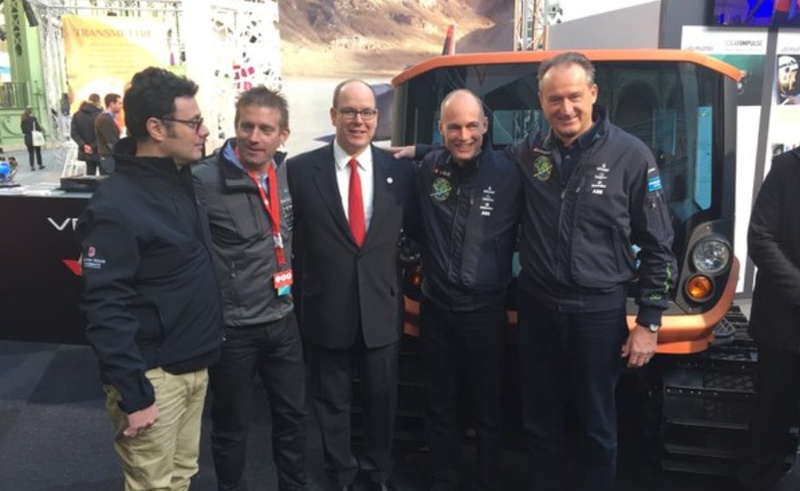 HSH Prince Albert II of Monaco Collaborates with the Famous Glenmorangie Company. 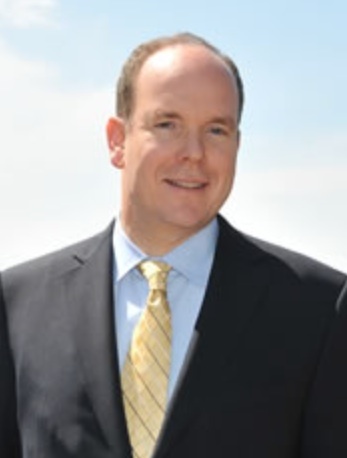 On December 3, 2015, the famed Scottish distillery, Glenmorangie, announced that they will collaborate with His Serene Highness Prince Albert II of Monaco to create a special whiskey bearing the sovereign prince’s name. Proceeds from the sale of the whiskey will be donated to various environmental causes. “The rare, single-cask whisky, bottled in his honour, will support environmental conservation, a cause dear to the Prince and echoed by Glenmorangie and La Maison D’Ecosse. In June, His Serene Highness Prince Albert visited Glenmorangie’s Highland home, to explore the unseen lengths to which Glenmorangie goes in the creation of its unnecessarily well-made whisky. There, on the shores of the Dornoch Firth, the Prince – a renowned connoisseur of single malts – selected a single cask, with the guidance of Dr Bill Lumsden, Glenmorangie’s Director of Distilling and Whisky Creation. Adorned with the coat of arms of the Prince’s House of Grimaldi, just 180 bottles will be created. The first two will be auctioned at the Monte Carlo Whisky Society’s annual festival in December, to raise money for the Prince’s environmental charity, the Prince Albert II of Monaco Foundation, and for Glenmorangie’s partner, the Marine Conservation Society (MCS). 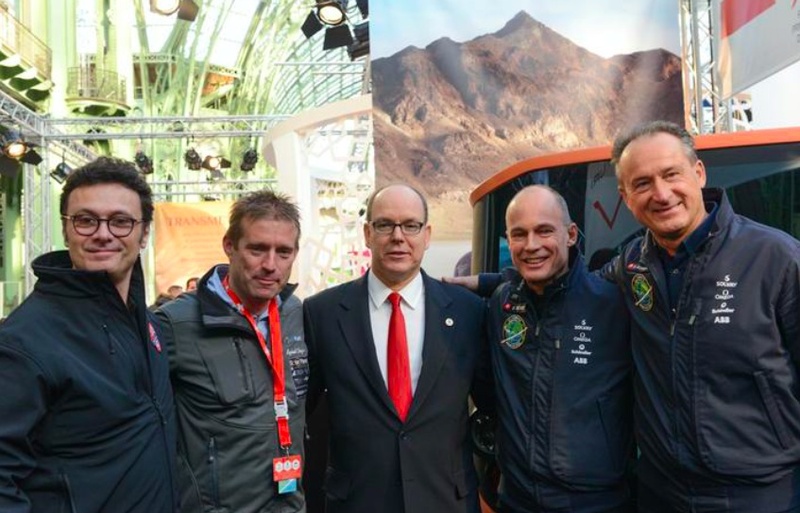 The remaining bottles will be used to support the ongoing work of the Prince Albert II of Monaco Foundation.